My coton de tulear is 13 months old now. He was very protective of our family from day 1. He loves us so much and we love him too. He has always been afraid of meeting new people and very protective of anyone coming near me. He would bark very loudly until that person left. He is ok with my parents and niece and sister and a few close friends that he sees more often and knows. But not well with new people. But my concern is that lately with me when I try to pet him around the face area or underneath his chin he starts to growl and show teeth. I am not afraid of him but someone else who sees this would definitely be afraid. He has never hurt me or bit me but I can't understand why he growls so loudly and shows his teeth to me, especially since I speak to him in a very gentle voice when he is doing this. Why does my dog go for me (Bit and growel) when I am cleaning up(pooh) after him or laying on the the floor to play with him? 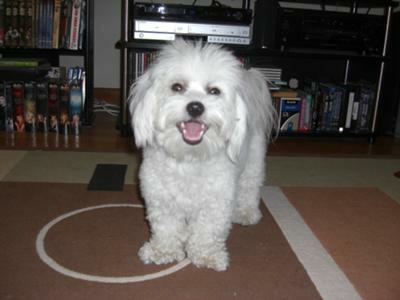 My dog Tuffy is a masculine two year old neutered male Coton de Tulear. He is cheerful, funny and playful with our family and friends. He has been through beginning, intermediate and advanced puppy training classes as well as a few sessions with a private trainer. He understands a large vocabulary of spoken words and hand signal commands. Now, more than ever, it seems he is developing a lot of aggression toward larger dogs, or any dogs coming into "his "space, which is wherever he is at the time. Even little dogs he plays with, once they get him worked up at play he starts growling and chasing them. We recently moved and I think some of it is territorial, but then again, my dog thinks the world is his territory and all humans are part of his pack. He loves people and children, and especially babies. When he goes after another dog on our walks I give the command to "leave it" but it is obvious his mind is only focused on that other dog.I have to pull him back to me on the leash telling him No!, leave it, stop , heel, or whatever I can get him to obey. He knows from my tone of voice I am not approving of his behavior, he gets placid and obedient when I get him back in the car, or in the house. The trainer taught me to keep the leash short, close to me, make him sit to calm him down, and in the case of seeing another dog or person, to continue walking. It is not always possible because I can be standing still when he dives out (on the leash) to another dog. His former teacher told me to give him a longer lead on walks so he would stop pulling. So, I am doing both. When we walk, Tuffy will get ahead of me then stop and wait for me and slow to my pace. As for people, he welcomes them excitedly and is happy to see them unless it is a stranger acting suspiciously, like sneaking around outside a neighborhood house in the dark. He's a great watch dog.I suspect he is being rowdy and wants to play, because even though he appears to be attacking at other dogs, his fluffy tail is waving playfully. We are dog sitting (for an extended period of time) for our neighbor's dog who gets along wonderfully with our dog. They play outside all day but have not "lived together" til now. Twice now in the last new days - our dog has nipped this dog while we were giving them both a treat. They growl and bark and even yelped - they have played like this many times in the past both at our neighbor's house, our house and outside. ???? I have a 7 yr old mixture of Jack Russell & Chihuahua.The mother is a Jack Russell & daddy a Chihuahua..He is very protective of me. He has never been a dog to sleep on the floor always on my or my husbands lap..Usually mine.. He acts like he's going to bite anyone that comes to my door. After they come inside it is usually ok, but then when they leave he acts like he's going to bite them. I have a 1 yr old Great-granddaughter who he has lunged at her while I was holding him. He barely scratched her but I can't have this. My grandson comes everyday but when he comes in he tries to bite him and when he leaves I think he's worse. What can I do? I need your help.